The Country Inn & Suites, Fort Worth West l-30 NAS JRB makes an ideal home base for your trip to the Fort Worth Stockyards. A 20-minute drive from Stockyard Station, our hotel puts you close to the best things to do on Fort Worth’s west side. Join the more than 6.5 million visitors who enter the Stockyards each year for a variety of restaurants, shops and entertainment. 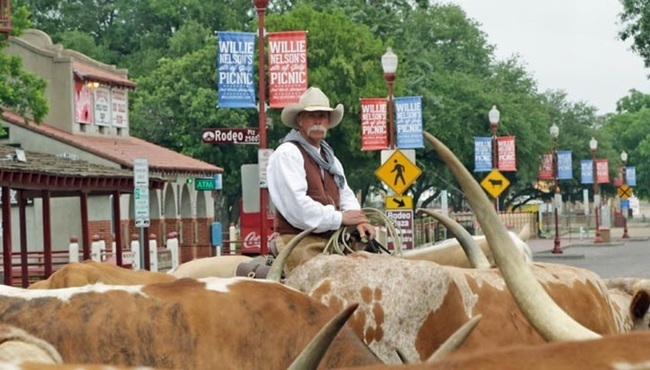 Take a guided walking tour through the Texas Trail of Fame and Cowtown, and then have lunch while the authentic Fort Worth cowboys drive their herd down Exchange Avenue. Love to shop? Drop by some of Texas’ most highly rated historical clothiers, wine stores, jewelers and art galleries. When you need to satisfy a hearty appetite, you’ll find a range of restaurants serving mouthwatering cuisines from Texas BBQ to Mexican fare. Every Friday and Saturday evening, you can cheer with the crowd at the Stockyards Championship Rodeo for a uniquely Texas experience. If boot scooting is what you love, Billy Bob’s Texas offers dance lessons, arcade games and live music. At the Country Inn & Suites, we are proud to partner with the Fort Worth Stockyards and offer special deals for Stockyards visitors. We hope to see you soon!